Custom Fields are important for collecting customized data points on your voters, as such it is important to us that your experience with both them and Ecanvasser is as smooth as possible. Custom Fields from your NationBuilder will be input directly along with your initial import of voter information to our People Database. 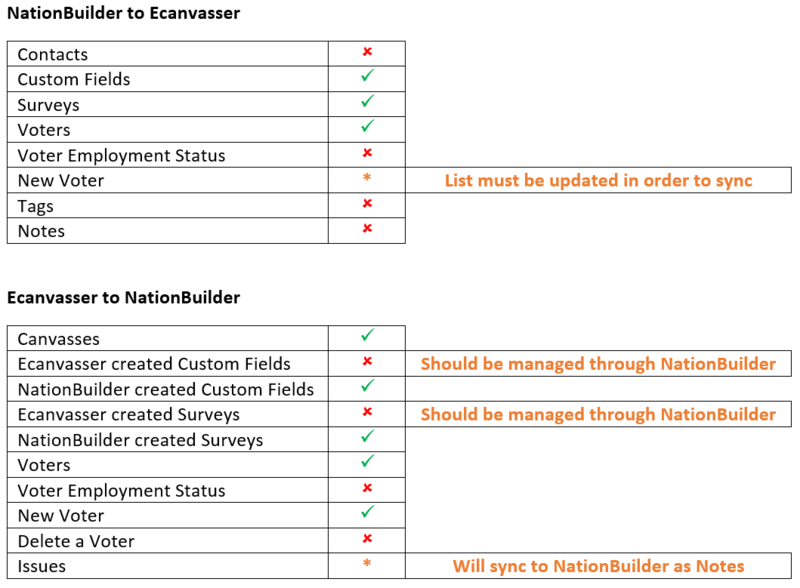 When a canvasser collects information relating to a Custom Field via the Ecanvasser mobile app, this will sync back to a user’s NationBuilder account. If you wish to pre-populate a Custom Field with generic information, this must be performed prior to syncing the Custom Field to Ecanvasser. If you experience any problems with your NationBuilder Custom Fields, please feel free to reach out to the Customer Success Team. They'll be happy to help.